We have some new details on the songs that have been added to Disney's live-action Aladdin. It was revealed earlier this year that the Oscar-winning songwriting duo behind La La Land and The Greatest Showman, Benj Pasek and Justin Paul, were on board to create two new songs for the upcoming reimagining of Aladdin. Now, we finally have word on what those songs are going to be, in addition to another pretty interesting tidbit that may delight or frustrate fans of the original animated classic. Benj Pasek and Justin Paul are working with Oscar-winning legend Alan Menken, who composed the music for the original animated Aladdin, on these new songs. In a new interview, the duo reveal that they worked with Menken to create a new solo song for Jasmine, who is being played by Power Rangers star Naomi Scott in the movie. Here's what they had to say about it. "We got to write a new song for Jasmine. Alan wrote a beautiful piece of music and [Scott] is incredible." In addition, they have also crafted a new duet for Jasmine and Mena Massoud's Aladdin, which they call a "sweet song." Unfortunately, they didn't have any further details on the tune at this time. Neither of the song titles have been revealed just yet, but that information will likely be withheld until much closer to the Disney movie's release. Last, but certainly not least, Pasek and Paul reveal that they got to write a new verse for the song Arabian Nights, which is a staple of the original animated movie. Disney purists out there may be a bit mixed on that idea, while others are probably just happy they'll have another verse to sing along with. Disney took a similar approach to last year's live-action Beauty and the Beast. All things considered, that worked out quite well, as Beauty and the Beast was the highest-grossing movie of 2017 worldwide. Aladdin comes from director Guy Ritchie, who is looking to rebound after last year's commercially disastrous King Arthur: Legend of the Sword. The rest of the cast includes Will Smith as Genie, Marwan Kenzari as Jafar, Navid Negahban as the Sultan, Nasim Pedrad as Jasmine's handmaiden, Billy Magnussen as a suitor for Jasmine and Numan Acar as Jafar's crony. Smith undoubtedly has the toughest job, as he has to try and live up to the legacy of the late Robin Williams' Genie. This is one of two live-action remakes Disney is releasing next year, along with Tim Burton's Dumbo, which hits theaters in March 2019. 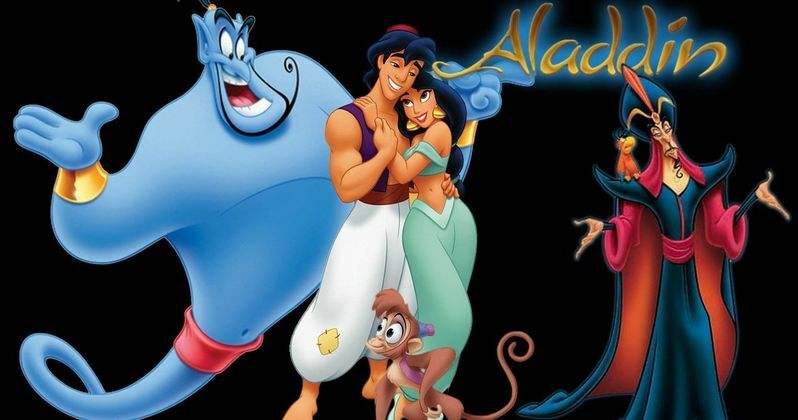 Aladdin is set for release on May 24, 2019, which was the date previously set aside for Star Wars 9 before the studio decided it was best to shift that to December. They also recently kicked off production on the live-action Mulan, signifying that they have no plans to stop these live-action remakes any time soon. This news comes to us courtesy of Variety.